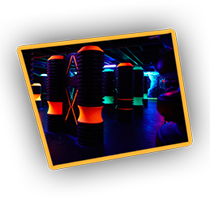 Step into Laser Matrix™, Louisville’s Favorite Laser Tag! 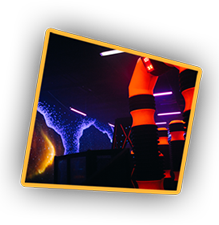 With over 5,000 square feet of swirling fog, futuristic lighting, and exhilarating sound tracks, its simply the best, its Laser Tag Louisville. Laser Matrix™ is built on the Laser Tron platform. The LT-11 is the most one of the most advanced laser tag game systems in the world. The "mainframe" computer keeps track of each player’s score in real-time, displaying the scores on the laser tag player’s vest and on monitors located throughout the arena. Large team score boards above the arena display the time remaining in the game as well as updating each teams’ score throughout the game. The team or individual with the highest score wins. The game formats at Renaissance Fun Park’s, laser tag louisville, is either Free For All or Teams. In free for all, players compete by tagging each other to try score the most points. 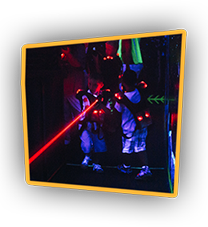 Laser Tag players receive unlimited laser pulses with shields when tagged and the ability for a reaction pulse. In a Team Format, players split into two different teams. Individuals work together with their teammates to "tag" other opponents and also tag opponents base stations. The team with the highest cumulative score is considered the champion. Each laser tag game runs approximately 15 minutes in total. This includes the briefing demonstration and vesting. 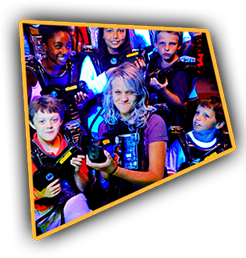 Up to 40 people can play in each game of lazer tag, $6.00 – 1 Game.